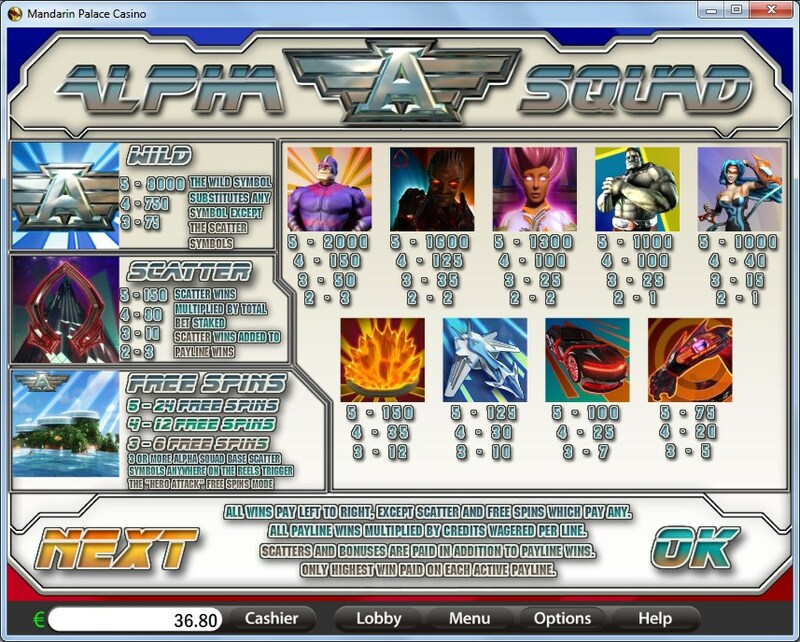 Alpha Squad appears to be a superhero themed slot machine, with multiple characters being part of the group mentioned in the title. The slot machine was designed by BetOnSoft (Saucify now). The design of the game is slightly unusual, the developers trying to show off some kind of futuristic world, and it works for it in a lot of ways, with the only complaint being about the hard to read fonts from the paytable. 5 reels & 30 bet lines are in Alpha Squad, a game that will also give you access to scatter symbols, to wilds and free spins. The slot gives away up to $12,000 from a single combo. The list of Alpha Squad features has on it the wild symbol, the scatter and some free spins. Overall, nothing you wouldn’t find in other games, but it’s still nice when you get most features that you could want. The Alpha Logo is first on the list, and for a very good reason. It’s the game’s best paying symbol, while also acting as a substitute and increasing the number of wins you can get from the regular symbols. The symbols for which it can substitute are the regular ones, those that have no special abilities. When it creates its own combinations, the wild asks that a minimum of three A Logos are part of the line, and the result will be a prize between 75x and 8,000x. The Omega Logo behaves like a scatter, which means that it can appear anywhere in the game, and it will award prizes by taking into account how many of them there are total. Starting at 3x for two scatters, the prizes can reach a top value of 150x the bet for five. 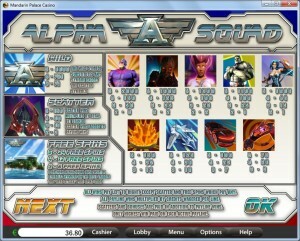 The slot’s free spins will start up whenever three ore more Alpha Squad Logos are on the reels, in scattered positions. They will provide you with 6 free spins for three symbols, 12 for four and 24 if all five are present. You choose the superhero character that will represent you first, and then the free spins will begin. Your superhero will attack one symbol each round, turning it into a wild. Retriggering the free spins is not possible. The complete betting range for Alpha Squad is between $0.01 and $45. Since 30 lines are used, that bet is split among them, with up to $1.50 wagered on each one. The line bet is composed of up to 15 coins, which have a maximum denomination of $0.10. While it’s designed to look futuristic, the game has its downsides, mostly because the way the task was approached. It looks like a mix between a comic book and a 3D style like you would see in some animation movies. The paytable fonts try to look the part as well, making texts from the future hard to read, something which I don’t imagine it will be true. Symbols: Alpha Logo (8,000x, wild), Omega Logo (150x the bet, scatter), Captain Shockwave (2,000x), Thadius (1,600x), Starlight (1,300x), Crusher (1,100x), Death Ray (1,000x), Fire Crystals (150x), Alpha Jet (125x), Omega Car (100x) and Thadius Armor (75x). Fans of the superhero genre will have no problem appreciating the design that was used in it. It also pays well enough and it gives you the features you would expect from it. All in all, a game that I would recommend. This Alpha Squad slot is offered by all online casinos with Saucify/BetOnSoft software, playable either in practice or in real money mode.